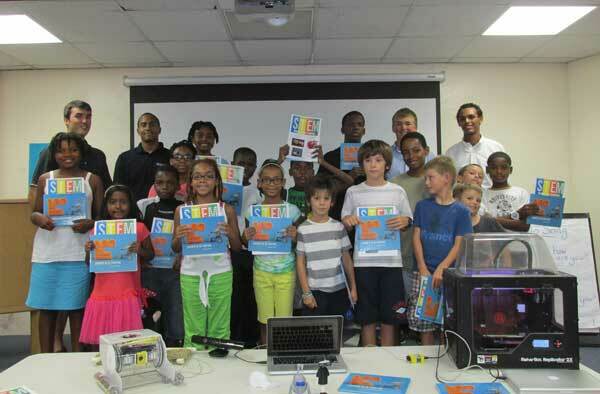 Twenty children, ages 5-13, had the opportunity to learn the fundamentals of science, technology, engineering and mathematics [STEM] education during a workshop at the Bermuda National Library’s Youth Services at 74 Church Street. As it did last year, the Youth Library once again hosted the workshop as part of its Summer Reading Programme, coordinated by Circulation Supervisor Nicole DaPonte. The STEM workshop was facilitated by BELCO Mechanical Engineer Michael Sinclair along with engineering summer students Peter Cooper, Chas Smith and Marlowe Smith. The workshop was an extension of STEM Camp held at Ascendant Group’s Training Centre in July. Both the camp and workshop were introduced by Ascendant Group in 2013 to engage children who have a particular aptitude for STEM subjects and to create awareness about careers in engineering and other technical fields. The children learned about robotics and 3D printing and participated in group exercises building towers from sheets of paper. They also had the opportunity to view video footage captured by a Remotely Operated Vehicle [ROV] submariner, built by Michael Sinclair, which gave them a closer look at underwater activity off of North Shore.